Grazing fish can help save coral reefs, but not all grazers are created equal, according to an FIU study published this month in Marine Ecology Progress Series. A combination of factors is leading to the alarming loss of coral reefs worldwide, including ocean warming, disease and pollution. To make things worse, algae that can harm corals have also increased on many reefs. Fish and sea urchins that dine on the algae can help reefs recover but are unlikely to do the job alone according to FIU researchers Thomas Adam and Deron Burkepile. The crystal clear tropical waters, which are home to coral reefs, are also a good environment for algae, which grow much faster than corals. If these algae are not quickly eaten by hungry herbivores they can smother adult corals and prevent young corals from finding a place to live. 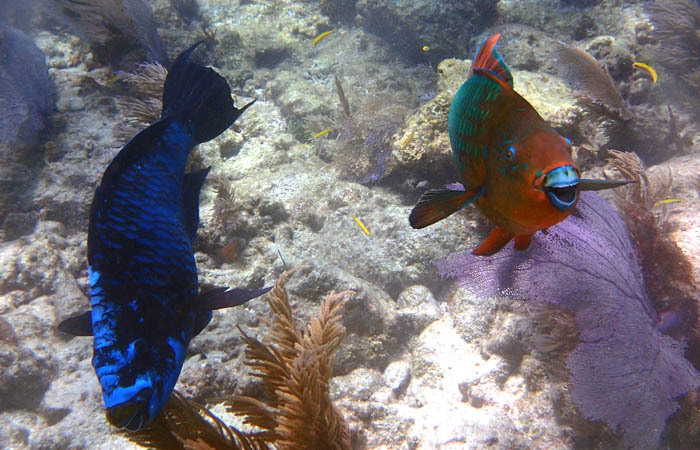 Midnight and rainbow parrotfishes are among the many herbivores helping to preserve Caribbean coral reefs. The study, funded by the NOAA Coral Reef Conservation Program, examines impacts of herbivores on corals in the Caribbean, a region experiencing an increase in algae and significant loss of coral reefs. In the Caribbean, algae began increasing in the 1980s, after spiny sea urchins — key grazers — were killed off by disease. Parrotfish eventually became the primary grazers on reefs in the region, but these herbivores are popular catches for fisheries. “Clearly, parrotfish need to be managed for their impacts on reef ecosystems, and not just as a fishery resource” said Burkepile, a biological sciences professor who has spent most of his career studying imperiled coral reefs. Parrotfish come in a number of varieties and play different roles on coral reefs. Some feed on microscopic turf algae, while others prefer larger seaweeds. Not all parrotfish live on coral reefs. The key for fisheries management, according to the researchers, is managing fish to keep them abundant in places where they can help corals. The findings contribute to a body of knowledge about the protection of coral reefs. While parrotfish are especially important for reefs, the researchers point out that a variety of herbivores are needed to help control algal growth. For example, surgeonfish eat algae that parrotfish do not like. More importantly, protecting herbivores is only one piece of a larger conservation puzzle.